We are delighted to announce that The Jetty Restaurant has been named Seafood Restaurant of the Year 2016! We were crowned winners on Thursday 15th September at the awards ceremony that took place at the Woodford restaurant in London. 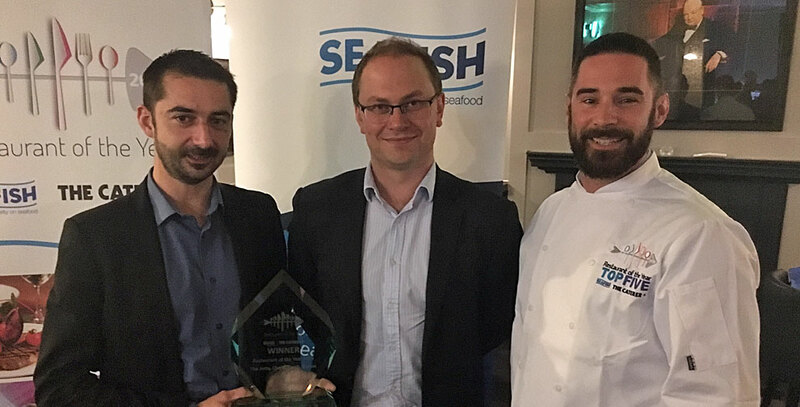 This is the second year of the competition, organised by Seafish UK and The Caterer, which was launched to highlight great use of seafood and businesses’ knowledge. The Jetty is very proud to have won this year, especially as we made it as a finalist in last year’s competition. Congratulations to the other shortlisted restaurants – Ondine, Edinburgh; One-O-One, London; Rockfish, Brixham; and the Staith House, North Shields, Tyne and Wear. As part of the prize three members of the Jetty team will receive an all-expenses paid trip to the fishing docks of Brixham or Peterhead, where they will expand their knowledge of the catching, processing and supply of seafood. Thank you to everyone who has supported The Jetty and we hope to see you in Mudeford soon!